Many times I have been asked about the way in which I processed and graphed the EEG data that I collected for my doctoral studies. For the purpose of my dissertation, I collected the EEG data using the Emotiv neuroheadset and used the EEGLAB open source software to process and graph the EEG data. In this post, I have simplified the steps that I took in order to process my EEG data. Please note that I self-educated myself by reading through tutorials, forum discussions, help pages, and much much more… I am positioning my doctoral work in the field of Neuro Information Science, which is marriage between neuroscience and information science. By no means do I claim to be a neuroscientist or a medical professional. Hope this helps some of you out there. Happy EEGLABing! I used the EEGLAB software, an interactive Matlab toolbox that is used for processing continuous and event-related EEG data, among others, in order to analyze the EEG data that I had collected for my research experiment. I used EEGLAB because it has been widely used in academia as well as in professional institutions, helping process complex EEG data while providing solid robust graphic user interface of the processed and the analyzed EEG data. 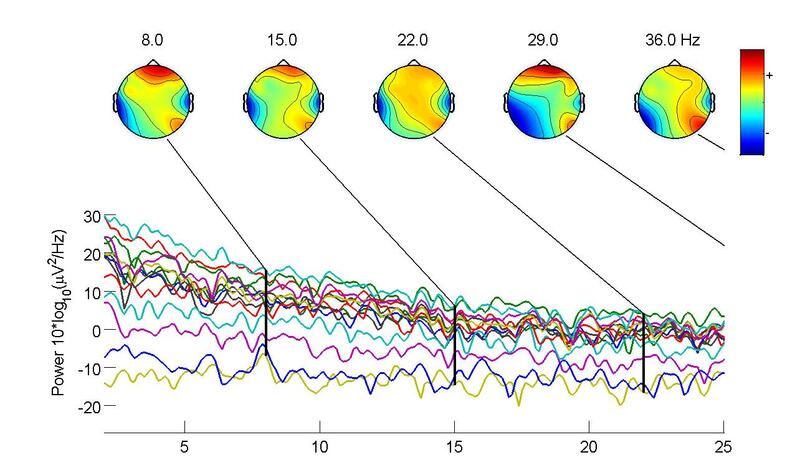 Moreover, EEGLAB provided several data visualization graphs that helped me greatly in my work to find and establish patterns of brainwaves during each phase of the ISP model. Go to the ‘File’ menu and click on ‘Import Data’ from the File menu options. Choose ‘From EDF File’. Find and choose the EEG data that is an EDF file saved on the hard drive and hit ‘Open’ in order to import it into EEGLAB. The ‘Load Data Using BIOSIG’ will open. In the ‘Channel List’ box, type numbers 3 through 16 with one spacebar between each number. This will map the 14 channels of the Emotiv neuroheadset data correctly to the EEGLAB software. Name the file in the field ‘Name It’. Go to the ‘Edit’ menu and click on ‘Channel Location’ from the Edit menu options. Go to the Text Editor of the computer and create a file as shown below. Save as a CED file. These numbers will map the 14 sensor channels of the Emotiv neuroheadset channel locations correctly to the EEGLAB software. Choose the above CED file from your computer and highlight it. Choose ‘Autodetect’ from the ‘File Format’ menu. Go to the ‘Tool’ menu and click on ‘Remove Baseline’ from the Tool menu options. Go to the ‘Tool’ menu and click on ‘Run ICA from the Tool menu options. At this point, you will see a window like this. Depending on the memory of the computer, this part may be time consuming, if the memory is low. Go to the ‘Plot’ menu and click on ‘Channel Data’ from the Plot menu options. The brainwaves look like this graph and include outlier data that shows as irregularities in the brainwaves. Highlight the outliers of the brainwaves. These outliers show as peaks in the brainwaves. Repeat highlighting until the end of the data. Click ‘Reject’ in order to delete all the highlighted outlier data. Name this new data set in the field ‘Save it as File’. Go to the ‘Plot’ menu and click on ‘Channel Spectra and Maps’ from the Plot menu options. Depending on the chosen brainwave frequencies, such graph will be displayed. This entry was posted on Saturday, February 6th, 2016 at 8:48 pm	and posted in Uncategorized. You can follow any responses to this entry through the RSS 2.0 feed. Thanks so much for your feedback and support! Yes, it seems that the images are not showing up, despite my efforts. Let me please see what the issue might be. Thanks! This is a simple introduction to EEG wearable in non-neuroscience related disciplines. I am working on the next book, which will be a more detailed one with clear detailed step by step ways to collect, analyze and visualize these datasets. Thanks! thanks for your great post. But i cant see any pictures. I want to creat ced file but i dont have locations value. Can you help me plz? Hello.thank younfor your post but i can see any pictures .i wqnt to creat a ced file as you explained in number 10 but i dont have any value.can you help me plz? You can create a location for the 14 channel modified combinational nomenclature Emotiv uses; In EEGlab go to Edit>channel locations, click on read locations and navigate to the sample location folder in the EEGlab installation package and select standard-10-20-cap81.locs. Here you’ll notice there are 81 channels present. All you have to do is delete all channels leaving just the 14 locations you need (AF3, AF4 ….etc). Then click on “save (as .ced)” and click ok. Thank you. this tutorial is so helpful. Just one point was a bit confusing for me: At instruction number 10, it is said that ”create a file as shown below”, but I can not find any link or something related below! Thanks again Nilo! Your tutorial is awesome and yet easy to follow!